At the end of the story circle held at the Learning History workshop in Feb 2008, participants were asked to give each story they had told a title. And then each group (there were 5 in all) was asked if these stories were made into a book, what would it be called. This group called their imaginary storybook - "Breaking the mould - finding new ways to skin a catalyst". No-one ever asks us! How a lone sustainability officer built a campaign to introduce sustainability measures in her Authority. 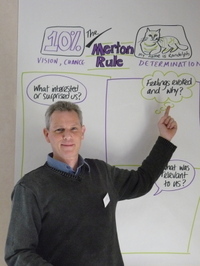 Read how, starting with an inclusive Lunch, one step led to another and the chief exec ended up on his bike! It's not me mate Read about a town in Russia where the politics and energy structures conspire to mean no-one can take a crucial decision. Result: A very cold February for inhabitants every year. Fourth Big Ambition Read a story that tells how, by getting a mix of people together in the same room, climate change and sustainability became the fourth big ambition for Sheffield. Long Distance Intimacy Read how a new generation Video Conferencing system is so realistic that one user sometimes tries to reach under a table 3000 miles away! The impacts for reducing business-related air-travel are very real for at least one corporate employee as well as his colleagues. On yer bike! Read an inspiring story about how an innovative cycle centre in the town of Middlesborough not only got people on their bikes to work but also spawned new projects and increased wider awareness of sustainability and environmental issues. Are you working in sustainability in Local Authorities? Then this website is particularly of interest to you! Browse around, add comments, read the stories, look at the analysis. Read more about taking part in this website here. This is not a forum community website however. Below is an invitation posted on behalf of Dan McCartney of the IDeA to join an online community that will enable interaction with your fellow colleagues on Sustainability. The Environmental Sustainability and Climate Change Community (on the IDeA’s Communities of Practice platform) could be of interest. The Community is fast developing into the premier national forum for interaction and sharing of information for those working or with an interest in sustainability in local government. To join the community, register on the CoP (Community of Practice) website – it only takes five minutes. Once you’ve registered, search for the Environmental Sustainability and Climate Change Community from the list of all communities. 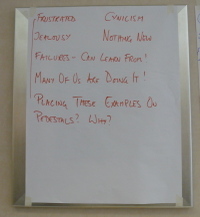 Participants express mixed feelings about 'iconic' examples. A learning history combines story with analysis. 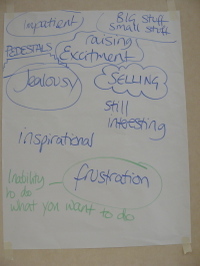 On the first evening of the Workshop we discussed how working with stories is different. A reader might have all kinds of conflicting thoughts/feelings whilst reading. Different readers will interpret the story in different ways. To prepare participants for this, we presented a brief overview of the 5 inspirational stories that would be featured throughout the event. We then asked for their reactions to those stories and we recorded these on posters. Don't iconify just these examples, warn participants. Mixed feelings about the Inspirational Stories presented. As the posters above show, 'inspirational stories' such as those featured in this research can provoke mixed feelings. 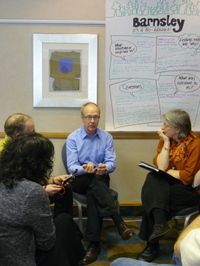 Participants saw that the stories were inspiring and clearly a good source of learning. However by putting just a few examples on a pedestal and asking others to learn from them an unintended set of consequences can arise: For example, less well-known but valuable projects in their own right remain unacknowledged when we hone in on just a few examples. Also the courage of those who 'tried and failed' does not appear to be recognised if we stick to the success stories. 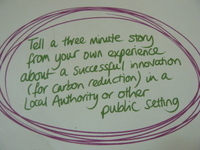 Keen to address this, an important part of the Learning History workshop was to invite those present to bring in their own stories of carbon reduction. This they did during story circles. They are also invited via this website to share their ongoing stories of addressing carbon reduction in their own locale.